Contained databases are one of the favorite features introduced in SQL Server 2012. Contained databases are isolated / independent databases from the other databases and from the instance it is hosted on. Today, we will go through a very simple script related to contained databases and in this script we need to find the list of all contained databases only. Given below is the script. In my earlier article, I wrote about different aspect of Concat function introduced in SQL Server 2012. In this article, we will compare the Concat function with the traditional concatenation techniques and analyze the performance. All of the above methods will give you the same result sets but lets view their performance given below. It is needless to stress that Concat function is much faster than the other methods. Note : The above queries have been tested on ~100K records. So, I planned to upgrade my query. Given below is my query that I used to retrieve processes using specified database since SQL Server 2000. --This query will work fine on SQL Server 2000 and above. Given below is my new query that works on SQL Server 2012 and above, having the same result set as the above. You can see that both the above queries result set is same but first query (sys.sysprocesses) will not be applicable for future versions of SQL. Let me know your feedback regarding both queries. In my previous article, I explained how to use offset rows and fetch next statement. In this article, I will explain Dont's for Offset Rows and Fetch Next. Let me explain it with simple examples. The number of rows provided for a FETCH clause must be greater then zero. The number of rows provided for an OFFSET clause must be an integer. The offset specified in an OFFSET clause may not be negative. A TOP cannot be used in the same query or sub-query as an OFFSET. If you know any other Dont’s, do share. 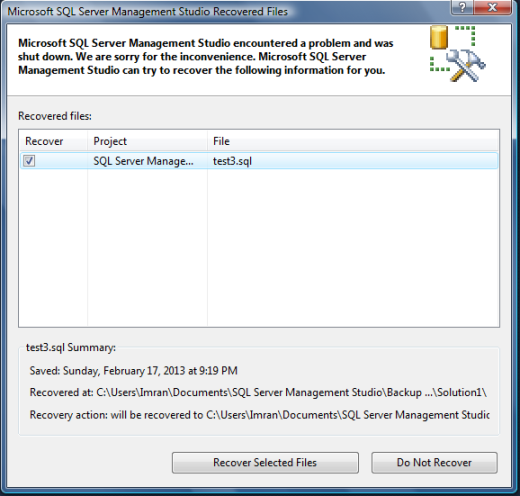 Auto Recovery Scripts is also one of the helpful features introduced in SQL SERVER 2012. It is GOOD NEWS for those who generally forget to save the scripts in SQL Server Management Studio (SSMS) or for some reason could not save the script or close the SSMS abnormally with scripts. By default in SQL SERVER 2012 (SSMS), this feature is turned on with default settings. 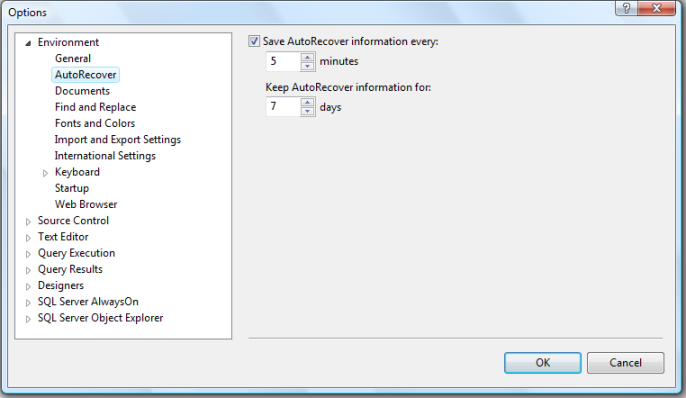 Given below are the settings available in Auto Recovery. You can set after how many minutes your script should be saved automatically. By default it is after 5 minutes. You can also set for how many days SSMS should keep those files. By default it is 7 days. 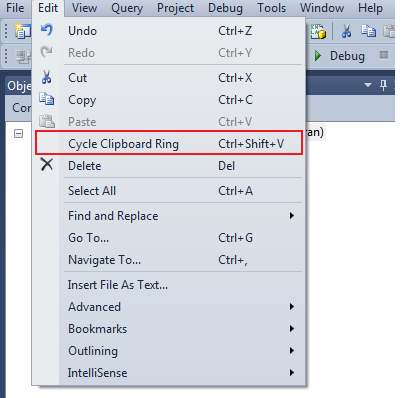 Cycle Clipboard Ring is one the nice features available in SQL Server 2012. This feature is available in Edit >> Cycle Clipboard Ring. Let me explain this feature with an example. If you copy different stuff in SQL server (SSMS) and paste it, it pastes only whatever stuff you copied Last. If you copy/cut all of the above one by one, then paste it in SQL Server (SSMS), it will paste only C because, SQL Server keeps only the last copied item in the clipboard and pastes it. First of all, copy/cut all of the above characters one by one in the same sequence. Now, wherever you want to paste, go to to the destination, click on the place. I liked this feature. Let me know how helpful it is for you.